Heat the oil in a large frying pan over medium heat. Add the onion and saute until softened and lightly browned - about 6 minutes stirring occasionally. Meanwhile in a medium bowl, beat the eggs, milk and salt together. Transfer the onions to plate. Reusing the same frying pan, increase the heat to medium-high and carefully run a wadded paper towel around the inside to clean. Add the egg mixture. As the egg starts to set, lift the edges of the omelet with a spatula and gently tilt the pan so uncooked egg runs beneath. When the top of the omelet is nearly set, spread the ham and onion over one side of the omelet. Carefully, flip the other side of the omelet over the fillings. 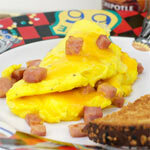 Turn off the heat and allow the omelet to cook an additional minute or two - flipping the entire omelet at least once. This will warm the filling ingredients and help make sure the egg on the inside gets completely set. 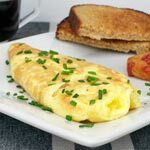 Slide the omelet onto a plate and serve. If desired, you can garnish the top of the omelet with a little freshly grated Parmesan cheese. Tips: You can easily turn this into a classic ham and cheese omelet by sprinkling 1/4 cup shredded Cheddar cheese in with the ham and onion before you fold the omelet over (skip the Parmesan and sprinkle just a little Cheddar on top of the omelet too). 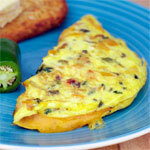 To get a Denver-style omelet, cut the amount of onion in half and saute it with 1/4 of a green pepper. 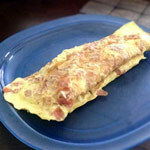 A very basic omelet with sauteed onion, chopped ham and Parmesan cheese. 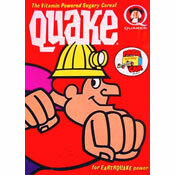 Mr Breakfast would like to thank starr for this recipe. 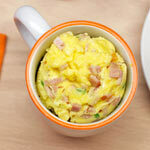 What do you think of Ham & Onion Omelet? Reduced the onion- it was great! Too much onion. It should just be 1/4 of an onion and it's much better. I think the ingredients should be 4 eggs instead of 3 eggs.